Looking for deals in Rio de Janeiro? Offering a sun terrace and views of the city, Selina Rio is located in the trendy Lapa district in Rio de Janeiro, 656 feet from Santa Teresa. Its really a hotel that also has rooms for sharing. Very clean, big and clean kitchen, bar/launge area and a rooftop terrace. Excelent location - just 2 block from the metro and tramvia line. Just two stops on tramvia from S-Dumont airport. And two block away from a the main Lapa restaurant scene. The particular location where hotel is, is wide open, there is always police, lot of people and food stands around on Thursday-sunday nights. But if you are looking for other hostels in the area, hotels location is the best - the atmosphere change to worse (dirty and dark) just few streets away. Located in the Copacabana district in Rio de Janeiro, 262 feet from Copacabana Beach, Ritz Copacabana Boutique Hotel features an outdoor pool and views of the city. Guests can enjoy the on-site bar. Excellent breakfast, comfortable room and bed, nice location and we had a room with beach view of the Copacabana beach. Definitely a recommendation.Nicely finished hotel and almost new in 2018 september. Boasting an outdoor pool and a Spa Center, Vogue Square Fashion Hotel by Lenny Niemeyer, BW Premier Collection by Best Western offers sophisticated accommodations designed by the famous Brazilian... Amazing location!! It’s inside a shopping center that has everything you need!!! The bed is amazing and super comfortable. I stayed in this hotel 4x in the past year and it’s been perfect every time! Offering an outdoor pool and views of the sea, Windsor Oceânico is located in the Barra da Tijuca district, 328 feet from the beach and 5 mi from Tijuca Forest National Park. I have been there before and the hotel is outstanding. Hotel Arpoador and is next to the famous Girl from Ipanema Park and 328 feet from Ipanema´s beach. Great staff, location, and breakfast. The elegant 5-star Belmond Copacabana Palace offers luxurious rooms with marbled bathrooms and panoramic ocean views, located on Rio de Janeiro's Copacabana Beachfront. The hotel is a lovely renovated hotel to stay in. Offering a year-round outdoor pool and views of the sea, Vila Santa Teresa Hotel & Spa is located in the Santa Teresa district in Rio de Janeiro. Vila Santa Teresa is a gorgeous property located in Santa Teresa. Located in Rio de Janeiro, Le Chateaux Joá Boutique Hotel provides free WiFi. 7 miles from Pedra Bonita, the property is also 9 miles away from Tijuca Forest National Park. Friendly staff, great food and fantastic views! With an unbeatable location in Flamengo district, Rio de Janeiro, Hotel Regina is set in a classical house with pale pink exteriors. Free WiFi is available. Staff wonderful, cheeful. Super clean. Set in Rio de Janeiro, just in front of Barra Olympic Park, Venit Mio Hotel features free WiFi access and private parking. The bar/restaurant by the pool side be expanded & to open early and close around 1. CLH Suites Domingos Ferreira is located in Rio de Janeiro, within 1.3 mi of Post 7 - Arpoador and 1.3 mi of Post 8 - Ipanema. Hotel staff was really helpful. Location was great! Rio Copa 6 offers accommodations in Rio de Janeiro. Every room at this hotel is air conditioned and is equipped with a TV. Nature Paradise Hotel is set on a mansion from the 60’s and features beautiful landscape views, a tropical garden and large swimming pool. It is 15 minutes’ walk from Corcovado cable cars. This place is a true Oasis in Rio!! Just 328 feet from Copacabana Beach, Hotel Vilamar Copacabana offers a modern gym, sauna and a sunny rooftop pool. Breakfast is served in the restaurant and room service is available. The helpful attitude of the staff; the entire staff from front desk to the room service waiter. 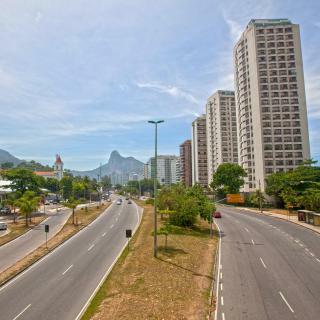 Located 1.2 mi from Rio de Janeiro commercial center and 1.9 mi from Flamengo Beach. The restaurant serves a daily buffet breakfast. I have no complaints. The stay was awesome. Offering an outdoor pool, Vila Galé is located right in Rio de Janeiro´s city center. The hotel features a complete wellness center and guests can enjoy their on site restaurant and bar. In the Lapa area so convenient at night if a bit crazy! What are the best hotels in Rio de Janeiro near Paquetá Island? Some of the best hotels in Rio de Janeiro near Paquetá Island include Hospedaria Santa Bárbara, Solar dos Limoeiros and Pousada do Paulinho. Which hotels in Rio de Janeiro have nice views? Vila Santa Teresa, Le Joux, and Le Chateaux Joá Boutique Hotel got great room view-related reviews from travelers in Rio de Janeiro. Which hotels in Rio de Janeiro offer an especially good breakfast? 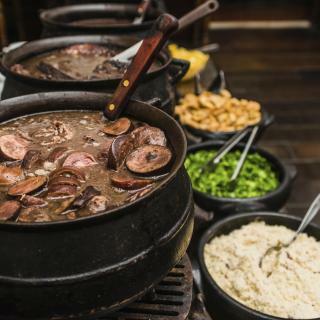 For hotels in Rio de Janeiro that serve highly-rated breakfasts, try Miramar Hotel by Windsor, Le Chateaux Joá Boutique Hotel, and Hotel Regina. Which hotels in Rio de Janeiro are good for couples? These hotels in Rio de Janeiro are highly rated by couples: Pousada do Recreio, Nature Paradise Boutique Hotel, and Windsor California Hotel. What are the best hotels in Rio de Janeiro near Galeao Airport? Travelers who stayed in Rio de Janeiro near Galeao Airport (GIG) have said good things about Linx Galeão, Rio Aeroporto Hotel, and Aerotel Galeão Terminal 2. How much is a hotel in Rio de Janeiro for tonight? On average, it costs $68 per night to book a 3-star hotel in Rio de Janeiro for tonight. You'll pay around $103 if you choose to stay in a 4-star hotel tonight, while a 5-star hotel in Rio de Janeiro will cost around $317, on average (based on Booking.com prices). Which hotels are the best ones to stay at in Rio de Janeiro? 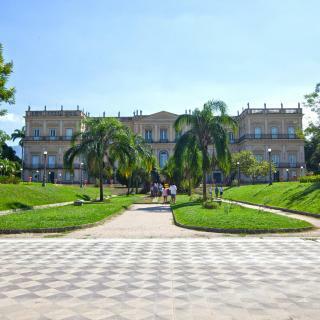 Windsor California Hotel, Miramar Hotel by Windsor, and Selina Lapa Rio de Janeiro are some of the popular hotels in Rio de Janeiro. 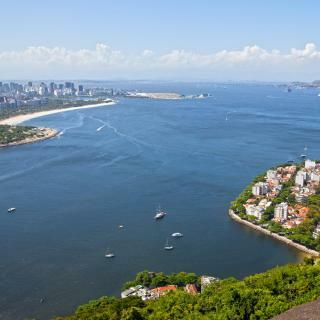 Which neighborhood is the best one to stay at in Rio de Janeiro? Copacabana, Ipanema, and Downtown Rio de Janeiro are popular with other travelers visiting Rio de Janeiro. How much is a hotel in Rio de Janeiro for this weekend? The average price per night for a 3-star hotel in Rio de Janeiro this weekend is $123 or, for a 4-star hotel, $196. Looking for something even fancier? 5-star hotels in Rio de Janeiro for this weekend cost around $689 per night, on average (based on Booking.com prices). How much does it cost to stay in a hotel in Rio de Janeiro? On average, 3-star hotels in Rio de Janeiro cost $69 per night, and 4-star hotels in Rio de Janeiro are $93 per night. If you're looking for something really special, a 5-star hotel in Rio de Janeiro can be found for $238 per night, on average (based on Booking.com prices). Which hotels in Rio de Janeiro are good for families? Many families visiting Rio de Janeiro loved staying at Pousada do Recreio, Rio Copa 6, and Nature Paradise Boutique Hotel. 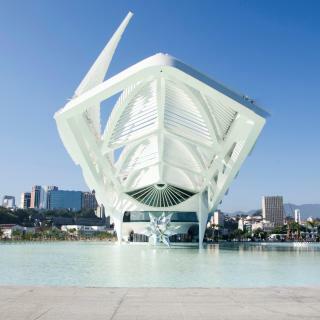 Home of samba, Brazil’s 2nd largest city is sassy, seductive and spectacular. The Rio Carnival is legendary the world over for outrageous costumes and infectious rhythms. 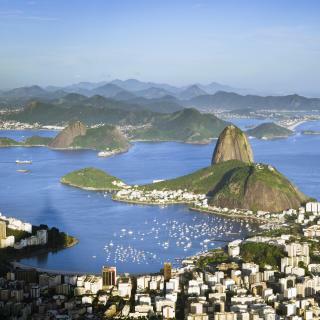 Host of the 2014 World Cup final in Maracanã stadium and the 2016 Olympics and Paralympics, Rio de Janeiro is forward-thinking. High rises line Ipanema beach and you can find dozens of rollerbladers on the promenades at any time. 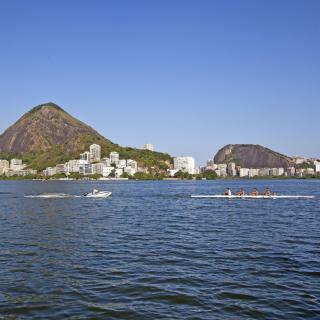 The hottest spot is Copabacana, a great place to try biscoito globo, a typical Rio beach snack. Sip a caipirinha here while the sun sets over the bay and mountains – it's unforgettable, but the fun doesn't end there. Clubbing in Rio is fantastic and ranges from techno to traditional bossa nova. Bohemian beats can be found in Santa Teresa and Lapa, where trams pass over a double-arched viaduct. Overlooking all this from Corcovado mountain is iconic Christ the Redeemer, welcoming the world to Rio with arms outstretched. Take a cable car up to this statue on the edge of lush Tijuca Park for incredible views. Accessed by cable car, Sugar Loaf Mountain is also not to be missed. Rio de Janeiro Airport is well linked to the ‘ Marvelous City’, but traffic can be manic, so leave enough time to reach it from your Rio hotel, apartment or hostel booked through Booking.com. Rio de Janeiro é uma cidade única no mundo, se encontra de tudo: praia, shoppings, construções históricas, trilhas, florestas, cachoeiras, morros, escaladas, esportes radicais, passeios de bicicleta, mergulho, asa-delta, paraquedismo, restaurantes, teatros, bares, forró, aulas de dança, museus, submarino... Tem muito mais que Cristo e Pão de açucar, as opções são infinitas, não conheço uma cidade mais turística que Rio de Janeiro, turismo para todos os gostos. Top spots- Brazilian steakhouse and nightclub. Top spots- Brazilian steakhouse and nightclub. I use the word lightly, because it was a quiet Bossanova Club- very intimate, chairs/tables close together, food/drinks available at reasonable prices, not noisy, mostly locals. Wonderful time. View from Sugarloaf can't be beat- day or night. Just don't wear your jewelry out!! First of all, people are nice. First of all, people are nice. Second, the food is good and the places around the city are just sth else. I like this combination between nature and man made infrastructure. Third, the beach is so crowd even in weekdays although the waves are not so quiet in Copacabana. Last but not least, if you go to Rio stay a bit far from the center due to the traffic altough I was walking around the city to better know the places. It is a very beautiful city with amazing landscape. It is a very beautiful city with amazing landscape. The ´cariocas´ ( people from Rio) are very nice and quite friendly. There are many options to visit and good places to stay and to hanging out with friends and relatives. My trip to Brasil was specifically to explore Estrada Real, Minas Gerais so I didnt plan any time in Rio, just flew in and out. Challenging figuring things out not knowing Portuguese - mea culpa. People friendly and helpful. Far less motorbikes buzzing around compared to MG cities. I spent my day in Copacabana using Uber to get there and back. Warm 27C despite light rain. Fine for exploring Forte Cabana and quick dip at the beach. Glad I missed the awful floods earlier in the week. The copacabana beach is at its most beautiful during the morning when there’s no people. Christ the redeemer gets jam packed easily by the hour. Sugarloaf mountain has the most beautiful sunset view of Rio. The downtown is very interesting with its old buildings and landmarks. Amazing and welcoming hosts. The hostel is converted from a house and all that ambiance comes along with it. My stay felt very homey and more like staying at an Airbnb. Close walking distance to Santa Teresa, Lapa, Centro, and a metro station to all other neighborhoods. I felt safe the entire time. Entire place was clean. Wifi was fast. Outlets near every bunk bed. Towels and foot rug provided in bathrooms. Kitchen is well equipped. Right opposite the beach for unbeatable sea views. Beach is much quieter than Copacabana or Ipanema but just as stunning. Very modern hotel with good beds and facilities. They provide towels for pool and their little beach area which is a nice touch. It's a fair way from main Rio, but take advantage of the peace! Also a nice bakery and kilo restaurant less than 10 mins walk away, just turn right out of the hotel. Perfect location just meters away from the selaron stairs and the start of the Carmelitas bloco, Sambadrome 25 min walk away and Ipanema and Copacabana just 20 mins by metro. Guillermo and Maize are very welcoming and take the time to get to know their guests. The house looks great, breakfast is wonderful (Guillermo makes an excellent omelet!). Loved it here and would totally stay again. Breakfast and the food in the restaurant were both excellent, although food and drinks were a bit pricey but you get 30% off food and drink when booking through booking.com. The staff were all very helpful and friendly. Rooms are comfortable and spacious and the hotel is right next to both Ipanema and Copacabana beaches. Would definitely recommend. Good location and safe area to stay in. The hotel was useful for the purpose of staying somewhere during carnival walking distance of both Ipanema and Copacabana beaches. The hotel staff were helpful and english speaking which helpes us understand where to go and how to get to places. The rooms were simple, clean and modern. We loved it at the PortoBay! Big comfy bed, powerful walk-in shower, balcony, rooftop pool, sauna, steam room, room service. It was luxury and right on Copacabana Beach. Streets surrounding the hotel felt safe, close to lots of great restaurants and subway. Staff were always helpful and friendly. This is a cool hotel in a cool area. Santa Teresa is a happening place and there is plenty going. The rooms are cool and you can really enjoy your time in this hotel compared to the over priced tourist hotels of Copacabana and Ipanema. We acutally booked another nights in this amazing hotel, as everything is roughly perfect. Directly at Copacabana is a really nice location and also close to Ipanema. Highlight is also the breakfast, as you get wonderful treatment. Amazing location near Arpoador (best sunset view in Rio) and right between Copacabana and Ipanema. Rooms are spacious, modern-looking (which is not always the case in Rio), and very comfortable. I highly recommend this hotel. Very good location, less than 5 minutes walking to Copacabana beach. Staff very friendly and helpful. Modern, clean and well decorated hotel and rooms. Our hotel room had an amazing balcony. Location (Not beachfront, but great spot if you are getting out to explore Rio, between Copacabana and Ipanema). Very spacious well kept rooms. Clean, tidy and well presented hotel. Good WiFi. This hotel’s location is very good, it’s just between Copacabana and Ipanema beaches and there are many restaurants, ATMs, supermarkets and other stores in the area. Perfect location. We stayed in a high floor. I think the hotel has probably the best view along the coast of Copacabana because of the height of the building. The hotel location was good its just walking distance to copacabana beach! Around the hotel there is a lot of restaurant and grocery. Its a good location. Room was spacious with a fantastic view. Copacabana beach was right across from the hotel. There is a restaurant and pool on the 30th floor. The Staffs are very nice. Good location easy to walk to two famous beaches in Rio de Janeiro both Copacabana and Ipanema. The room was clean The hotel is located right at the COPACABANA beach so location is perfect. The staff of the Fasano are some of the best I’ve ever encountered. Special thanks to Isa the night manager who resolved a small mix up for us on our last day in the most pragmatic and thoughtful way. Can’t recommend this place enough. The hotel is a lovely renovated hotel to stay in. The rooms and service were excellent and the bar area was great to relax at after a day on the streets. All the staff were super-attentive and did their best to satisfy all our wants.